Dannell Antonio Ellerbe (born November 29, 1985) is an American football linebacker who is currently a free agent. He was signed by the Baltimore Ravens as an undrafted free agent in 2009 and has also played for the Miami Dolphins, New Orleans Saints and Philadelphia Eagles. He played college football at Georgia. Ellerbe went to the University of Georgia for five years. He played for four seasons after a redshirt freshman year. During his SEC career, he played in 43 games, totaling 148 tackles, 8.5 sacks, three interceptions, two recovered fumbles, and one forced fumble. 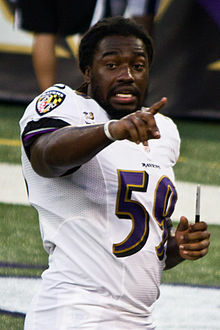 In a 2010 preseason win against the St. Louis Rams, Ellerbe returned an interception 45 yards for a touchdown but was yelled at on the sidelines by head coach John Harbaugh for showboating. Ellerbe had held the ball in front of him twice during the return. Ellerbe made the roster as a backup linebacker behind Jameel McClain, who also was signed by Baltimore as an undrafted free agent. Dannell Ellerbe's tackles dropped to 31, but he recorded his first career sack. In 2011, Ellerbe played in 9 games, starting 3 in Ray Lewis' absence due to injury. He recorded 19 tackles. Going into the 2012 season as a restricted free agent, Ellerbe was re-signed to a one-year, $1.927 million contract. On January 20, 2013, in the AFC Championship game against the New England Patriots, Ellerbe intercepted a pass from Tom Brady that had been tipped by Pernell McPhee in the 4th quarter with 6:49 remaining in the game. This was one of the three turnovers by the Patriots that allowed the Ravens to win 28-13 and advance to Super Bowl XLVII, where they would defeat the San Francisco 49ers 34-31. Ellerbe signed with the Miami Dolphins on March 12, 2013. In his first season with the Dolphins, he finished the year with 101 total tackles, 2 interceptions, and 1 sack. The 2014 season was a wash for Ellerbe as he was on injured reserve for the majority of the season. On March 13, 2015, Ellerbe was traded along with a third round pick to the New Orleans Saints in exchange for wide receiver Kenny Stills. Ellerbe was injured most of the year, but recorded 13 tackles and forced a fumble in a Week 5 game against the Atlanta Falcons. In 2016 he played in 9 games and was credited with 4 sacks. On July 25, 2017, Ellerbe was placed on injured reserve after suffering a foot injury. He was released on August 25, 2017. On November 12, 2017, Ellerbe signed with the Philadelphia Eagles. Ellerbe won his second Super Bowl ring when the Eagles defeated the New England Patriots 41-33 in Super Bowl LII. ^ John Harbaugh Chews Out Dannell Ellerbe for Showboating on Touchdown-Larry Brown Sports Retrieved August 26, 2012. ^ Patra, Kevin. "Saints trading WR Kenny Stills to Dolphins". NFL.com. Retrieved March 13, 2015. ^ Patra, Kevin (July 25, 2017). "Saints place LB Dannell Ellerbe on injured reserve". NFL.com. ^ Katzenstein, Josh (August 25, 2017). "Saints release Dannell Ellerbe from injured reserve". NOLA.com. ^ George, David (November 13, 2017). "Eagles Sign Veteran LB Dannell Ellerbe". PhiladelphiaEagles.com. ^ "Dannell Ellerbe Stats". ESPN. ESPN Internet Ventures. Retrieved May 5, 2015. Wikimedia Commons has media related to Dannell Ellerbe. This page was last edited on 25 February 2019, at 16:44 (UTC).